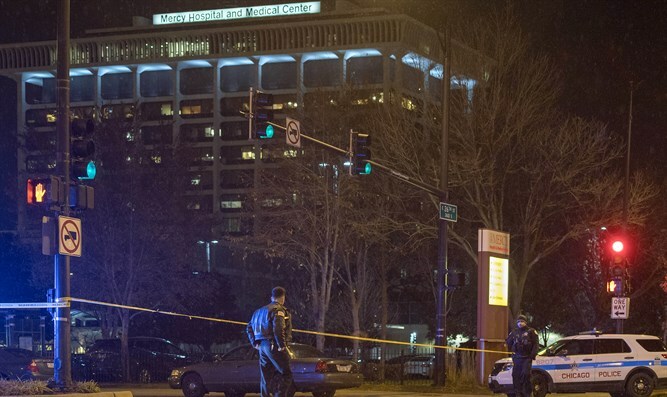 Four people shot dead at Mercy Hospital in Chicago. In Denver, one dead in shooting downtown. Four people were shot and killed on Monday, including the suspected shooter and a Chicago police officer, at the Mercy Hospital on the South Side of Chicago. An emergency room doctor was also killed, according to ABC7 news. Police said shots were fired both inside and outside the hospital between 3:00 p.m. and 3:30 p.m. local time. Chicago fire officials said two women were shot; one was taken to Northwestern Memorial Hospital in extremely critical condition, the other was taken to University of Chicago Hospital in extremely critical condition. Sources told ABC7 that one of the women, who was shot in the parking lot, was a doctor at Mercy Hospital reporting to work, and was shot by her former fiancé. The sources said she was the first to be shot, and that the gunman then moved into the hospital and continued shooting. Chicago police spokesman Anthony Guglielmi said CPD officer Samuel Jimenez was shot and taken to University of Chicago Hospital in critical condition. Guglielmi announced Officer Jimenez had died just after 7:30 p.m. Shortly after 4:40 p.m., the hospital tweeted that it had been given the all clear. “A shooting took place at Mercy Hospital and Medical Center this afternoon. The shooting at Mercy Hospital is over. Chicago Police Department have secured the hospital and patients are safe,” it said. A witness who was across the street at the time of the shooting said he heard six or seven gunshots that he initially thought were sounds from nearby construction. He said he saw a large police presence arrive at the hospital shortly after, and people running out of the hospital. Witnesses who spoke to ABC7 Chicago outside the hospital said they heard a flurry of gunshots, as many as 10 to 20. Hours later, a shooting took place in downtown Denver. One person was killed and three were injured, the Denver Police Department said, according to local TV station 9News. No suspect is in custody and no suspect information is available. DPD spokesman Doug Schepman said he was concerned for the residents in the area, and said there was an active search for the person responsible.